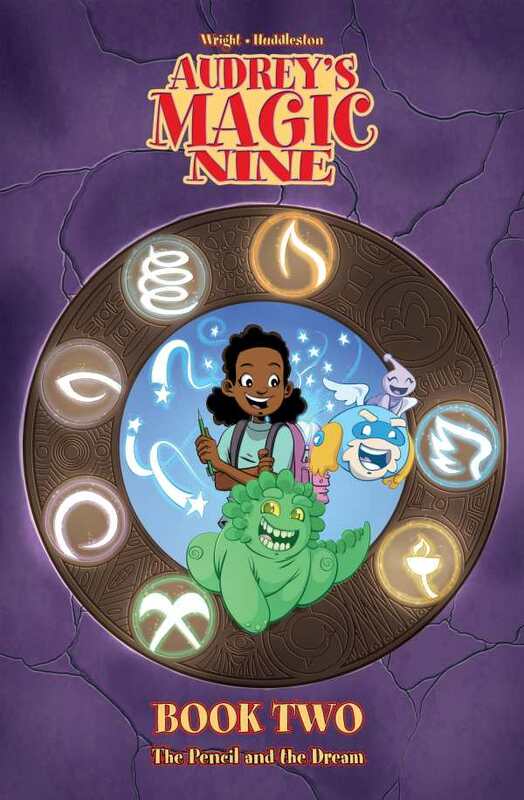 A young girl explores her past and present, one alien puppet at a time, in the children’s graphic novel Audrey’s Magic Nine: The Pencil and the Dream. The Pencil and the Dream jumps right into the action, continuing from the first book with the story of Audrey, a twelve-year-old girl who lives in the suburbs with her adoptive parents. There are plenty of interesting subplots, including Audrey’s relationship with a bully and her parents’ attempts to hide their true selves in order to better fit in with their neighbors. The main story, however, revolves around Audrey’s efforts to find and reunite the nine members of a protective alien council, who have been contained in the form of small hand puppets and scattered around town. Audrey already holds a few of the puppets. As she finds more at a yard sale and other, less likely, locations, her mysterious background and more details of the alien planet Vorgon are revealed. In addition to four new chapters of the ongoing story, four short bonus stories are included at the end of the book, shining light on Vorgon and the supporting cast and building an even richer imaginative framework for the Audrey’s Magic Nine universe. The book’s artwork is outstanding, a style that inhabits the sweet spot between cartoonish and realistic, unafraid of the occasional exaggeration to aid storytelling but with a level of visual detail that helps to suspend disbelief. Audrey’s Magic Nine: The Pencil and the Dream is a safe bet to appeal to its target audience of third to sixth graders and should be considered by libraries catering to that age group.